Description: Jojo is a 22cm (8 1/4") bear made from Schulte ratinee blend in mohair and alpaca which has been handdyed in a soft pale pink. She has footpads and inner ears made from a mint green coloured ultrasuede. She has needle sculpted and hand shaded facial features with German hand-blown black glass eyes and white ultrasuede surrounds. She has extensive scissor sculpting to give her lovely chubby cheeks. 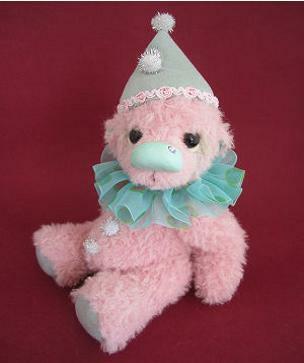 She has a hand-crafted mint green clay nose with a diamante inserted, is 5-way T-pin jointed and is filled with poly flock and wool stuffing and glass beads for weight. 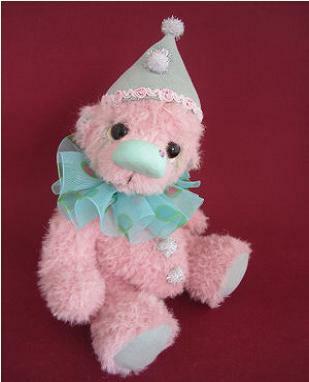 She is wearing a cap made from mint green ultrasuede trimmed with a pale pink trim and silver and white pompoms.